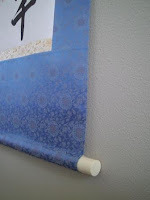 Lately, many of my customers have been ordering Kiribako, which is a storage box for scrolls. Some sites claim they are made of paulonia wood, but the ones I purchase from Japan are made of Cedar. This wood is a natural repellent to moths, which like to ruin scrolls in storage. They are beautifully and custom handcrafted items, that increase the value of your gift. This particular box is for the scroll, posted as a Last Name Translation. 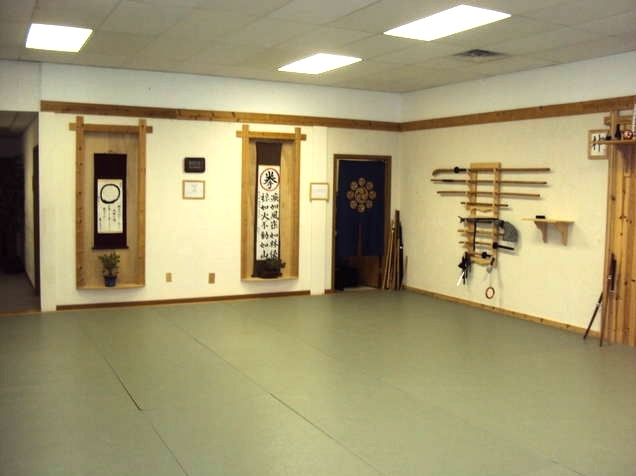 This customer ordered two scrolls for their dojo and several shikishi for student rank advancement awards. I love it when customers provide the details of their custom handmade kakejiku or hanging wallscrolls. I was really pleased with the way this kakejiku turned out. The customer selected a beautiful cloth for this wallscroll, and I was really pleased with the look and the feel of this. The last name to translate was Franssen. My wife came up with two, and the customer chose this one. It means 1,000 years of peace. Technically, the first two is no violence, but we used some liberty in having a more positive meaning, which would work in Japanese. 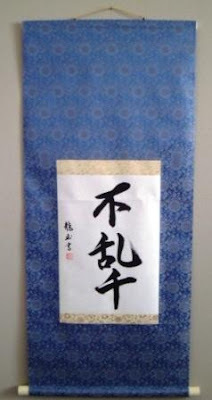 It is written in a Semi-cursive Gyousho style by Yoshimi Maples. (Ryugyoku) The new cloths from Japan are very beautiful. You can see the detail, and the beauty of the intricate patterns in the kireji (silk) up close. When something turns out this nice it really makes me happy. 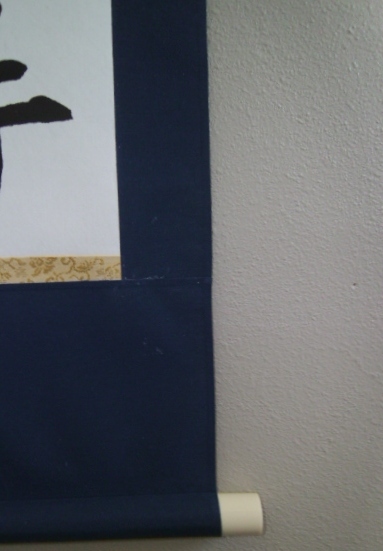 There is also a kiribako for this scroll which I will take another picture later on. If you are interested in having a custom scroll made for your home or business, e-mail to sales@customjapanesecalligraphy.com Dimensions of the scroll as follows. ***This is not an Akutagawa Painting. It is based upon the painting of the Kappa by Akutagawa. It was painted with calligraphy done by Horinouchi, Natsuko. A sumie and shodo artist located in Germany. This was ordered as a gift for someone back east. You can read about the legend of the Kappa at this link to Wikipedia. Although it says in this article, that it is specific to Saga Prefecture, it was a constant and recurring image, along with the Game, in the town of Yatsushiro in Kumamoto prefecture where I lived for 7 months in 1994. I really enjoyed making this scroll. It was a challenge due to the size, but also the theme. I chose the Ichimonji to represent the flowing water in which it lived, and the green/yellow silk to represent the grassy/mossy banks that surround some of the rivers that I saw in the countryside. 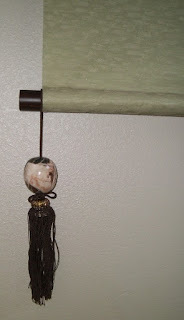 The kakehimo, is hard to see, but it is a light green, (Kinka) to complement the green cloth. The dark Ebony (kokutan) jikusaki really match well with the Earthtones of brown, and tan in the Fuchin. 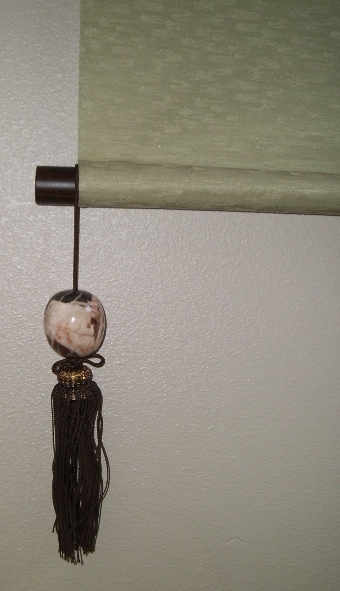 I used the Brown hanging string to blend invisibly onto the jikusaki.